A cat’s normal body temperature is in the range of 100.4oF to 102.5oF. While we’re likely to worry if our cats are running a temperature, we tend to assume that because they have fur coats, they’re less susceptible to the cold. When temperatures drop outside, that’s certainly true of most healthy, well fed cats. But cats that are ill, feral and outdoor cats that may have weaker immune systems because they aren’t well fed, fit and healthy can suffer more when it’s cold outside. And when the temperature drops below freezing – which is 32oF on the thermometer – then even the hardiest cat can fall prey to hypothermia and frostbite. Some owners opt to buy generic heating pads and wrap them in a blanket or towel to keep their pets warm. This isn’t ideal: the pad will need constant monitoring and checking to ensure it stays at a sufficiently low temperature to ensure the cat doesn’t get burned. If you want your cat to stay warm and have peace of mind that she’s safe while she sleeps, then check out these five beds designed especially for cats below. 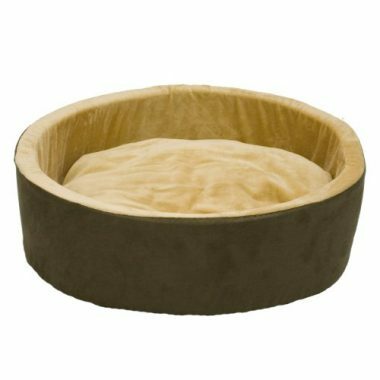 The snug Aspen Pet Self-Warming Bed does not incorporate a heating pad, but is guaranteed to keep your cat warm nonetheless. It employs the same principle as Mylar ‘space blankets’ used by astronauts, in that the materials within the sleeping pad reflect the cat’s own heat back. If you’re worried about the safety of electrical heat pads, then this is a good option for indoor cats. 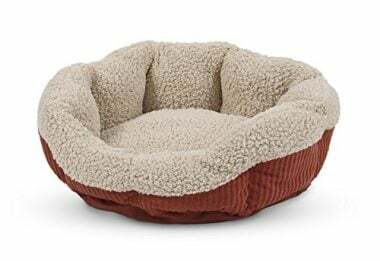 The sides are sturdy enough to take some punishment from cats that like to dig and knead before they get comfortable, while the sleeping area is soft and cushioned. The bed also features a non-skid bottom, making it safe around the home – an owner accidentally stepping on it won’t slip along the floor. While the cover isn’t removable, the entire bed is washable; simply throw it in the machine on a cool wash with a mild detergent and line dry. K&H Pet Products’ Thermo-Kitty Heated Pet Beds come in two sizes, perfect if you have more than one kitty that wants to use the product indoors. The bed features a low watt heating pad with dual thermostat; this has been designed to be left on safely around the clock, seven days a week. Alternatively, the heater can be removed in warmer summer months. It’s been safety tested and approved by MET labs to stringent standards, so you don’t need to worry about electrical fires. The heated bed only needs to be unplugged if you’re away from home for any length of time. The high walls are soft yet relatively sturdy, ideal to protect your cat from drafts and give them a sense of security while they sleep. It’s also easy to clean. The pillow containing the heater can simply be unzipped and the cover washed in the machine, on a cold wash. Use a very mild detergent to avoid upsetting the delicate pH of your cat’s skin. There’s a one year limited warranty on this product, which is recommended for indoor use only. Another option that doesn’t use electricity is the Pet Magasin Thermal Self-Heated Bed for Cats. 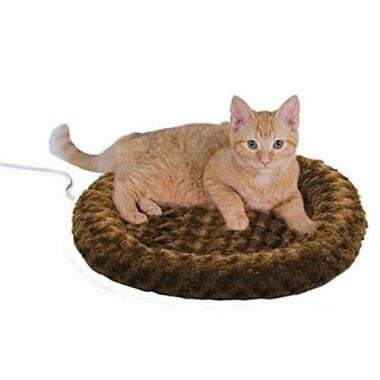 These come in a pack of two differently sized mats, so you can position them in places your cat likes to snooze. The heat technology is supplied by the inclusion of Mylar, a reflective material used in space suits and blankets by astronauts. 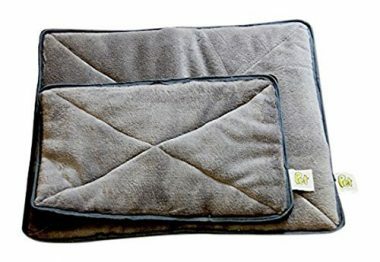 This absorbs, retains and reflects your pet’s body heat, keeping them cozy even when used on hard floor surfaces such as stone, linoleum and so on. Because of this, they are great for outdoor cats as well as indoor, provided they’re placed in a sheltered area such as a garage or porch. With a rubberized underside, you won’t need to worry about slipping on these mats and they shouldn’t move around too much as your cat kneads them to get comfortable. The Mylar layer is protected by a velvet style cover and the whole bed is padded with thick hypoallergenic foam for comfort. These beds come with a generous two year warranty and a full money back guarantee if you’re not satisfied. 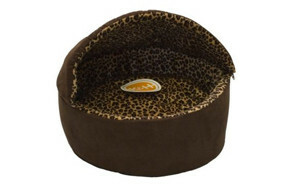 The K&H Pet Products Thermo-Kitty Deluxe Heated Cat Bed is adaptable! It comes with a hooded top, perfect for cats that like to hide and feel safe when they sleep. Alternatively, the hood can be zipped off and the bed used in basket-style. 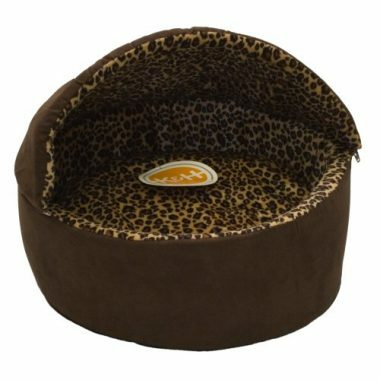 The cat bed features a 4 watt heater that’s removable for easy washing of the cat’s sleeping area when needed. The heat pad has been rigorously tested and is certified MET Listed. However, this means the bed is not as suitable for outdoor areas where damp is a possibility. The heater can be left on 24/7, and has a dual thermostat. It typically heats to 10-15o above the ambient temperature, but has been designed not to overheat your pet beyond its normal body temperature. The walls are constructed from orthopedic foam, which can be removed so the entire cover can be thrown into the washing machine on a delicate wash, at cool temperatures. Either line or tumble drying is fine and won’t damage the bed. Another K&H Pet Products bed that comes with an in-built heater, the Fashion Splash is recommended for indoor use and comes in two sizes, with the larger one suitable for bigger or multiple cats. 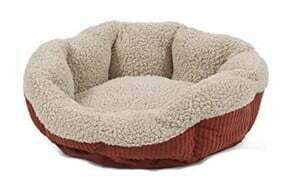 The base is constructed from orthopedic foam for support and comfort while your pet is sleeping. The cover is soft and inviting to the touch and comes in a funky design to fit in with your décor! The heater is removable, so can be taken out when the pet bed needs washing or in summer when the heating is not required. The heating pads come in 4 or 7 Watt versions, depending on which size bed you choose. Both are certified MET Listed for safety and energy efficiency. While on, the heat pad is 10-15o warmer than the ambient temperature, and then adjusts to your pet’s body temperature when they lie on the bed. 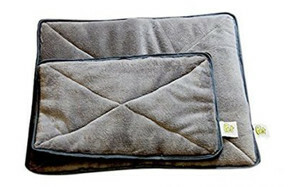 The entire bed, once the heat pad has been removed, is machine washable and the product comes with a one-year warranty. There’s a bewildering array of cat beds on the market now, both heated and unheated versions. And cats can be contrary creatures, making their own decisions about where they sleep when it’s cold outside. But take into account the factors below and you should know whether a heated cat bed is a good choice for your cat; and be able to purchase one that appeals to your fussy feline. Being cold depresses a cat’s immune system, making him more susceptible to germs and illness. Heated beds, especially in winter, will prevent that. If your cat is under the weather or convalescing after an illness or operation, then providing a warm and cozy place to sleep will encourage him to rest and sleep – the one thing that’s absolutely essential for his recover. Older cats who are suffering from stiff joints or arthritis will benefit from a heated cat bed, as the warmth will help to ease the condition. Remember that cats have thin skin and so are likely to burn easily if exposed to any heat that’s too intense. They’ll know themselves when to move away from a roaring fire or other heat source. But if you’re choosing a heated bed for your feline friend, make sure it’s designed with cats in mind and that they can easily walk away if they get too warm. If you are stuck between various choices of cat bed for your pet, then opting for ones that most closely resemble their existing favorite sleeping places is a good idea. Perhaps she likes curling up and snuggling down where she can’t be seen? In this case, a semi-enclosed structure might appeal to her. If she’d rather stretch out or see what’s going on around her, then one of the flat mats with heaters included would probably be her bed of choice. Cats are also alert to danger from every source and many prefer to sleep with their back against something – if you’ve noticed that’s the kind of place she tends to choose, then one with walls to lean up against might appeal more than open ones. If the bed is to go in a shed or garage for an outdoor cat, then the walls will also cut down on drafts. However, don’t forget to consider your cat’s own physical condition. If she is stiff from arthritis or sore after an operation, make sure you choose one that is easily accessible – one with high sides probably isn’t going to be practical for her to access. It’s important to have a cat bed that you’re able to keep clean easily, so seek out one with removable covers for washing or that can be washed in its entirety. Of course, you need to be able to remove any heat pad before throwing it in the washing machine! There’s a good reason why so many cats love snuggling up on their owners’ knees. And if you look at any sleeping cat, you’ll probably see them curled up into a ball with their tail wrapped around their paws and body. This helps them retain and maximize body heat. So the main benefit of a heated cat bed is, of course, that it helps keep your cat warm. They’re especially useful for cats that spend long periods of time alone and/ or outdoors; are recuperating from or susceptible to illness; or suffer from muscular or joint pain. Positioned correctly, they also give your cat somewhere safe and secure to sleep, which together with the warmth, will improve their temperament too. Q: Does My Cat Need a Heated Bed? Has your cat had a recent illness or a serious operation? Is your cat an older one, with mobility problems like stiff joints and/ or arthritis? Does the cat you are considering buying a cat bed for have access to appropriate shelter and regular access to water and food? This applies mainly to outdoor and feral cats, who can be more vulnerable to cooler temperatures because they aren’t generally in fighting fit condition. Are you out all day, leaving your lap cat alone? If you prefer to turn the heating down low in winter to save energy while you’re at work, then a cat bed can help your cat stay warm when temperatures drop and she doesn’t have an owner to snuggle up to. Q: Will Using a Heated Cat Bed Push Up My Electricity Bills? A: Customers report that the cost of running one of these beds is minimal. The 4 Watt versions mentioned above, for instance, are said to use as little energy as the standard night life. Built with energy efficiency in mind, many are also controlled thermostatically, meaning they only heat up when they are in use. Check the manufacturers’ description before you buy if you’re concerned and always follow the instructions for use. A: Generally speaking, if you do your research; buy a bed from a reputable manufacturer of pet products; and follow the instructions to the letter, then yes, these types of bed are safe. Look for one that meets current safety standards. Also ensure that the one you buy guarantees that it’ll only heat up to the cat’s own body temperature, no higher. As mentioned about, cats have delicate skin, and you don’t want to run the risk of burning her. If you’re still concerned about the dangers of electrical heated cat beds, or are determined to save on utility bills, then the self-heating options in our selection above will probably appeal to you.